JH Group are delighted to have worked on this project. 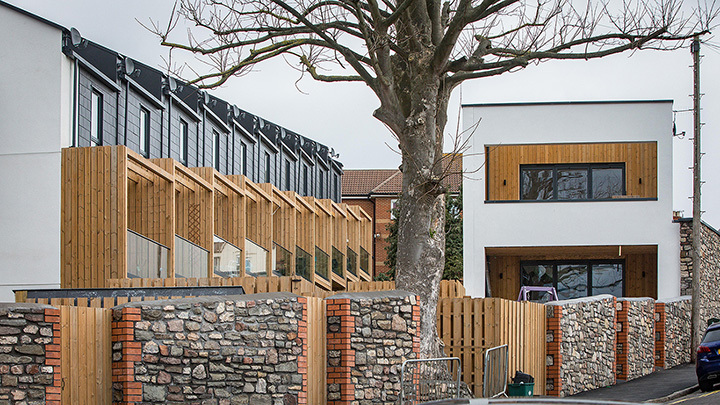 Congratulations to our Colleagues at Ferguson Mann Architects for being shortlisted for Bristol Property Awards 2019! We are very proud to have worked on this project. We at JH Group were contracted to carry out the excavation, drainage & landscaping for a new build development. Comprising of a modern terrace of 14 houses facing Balfour Road, with a block of three flats at the Carrington Road/Smyth Road end. We look forward to hearing the winners announced on 17th May at a ceremony at Ashton Gate stadium. Good luck Ferguson Mann Architects. The redevelopment of South Bristol is it would seem, not easing up. Bristol City Council have pledged to build 6,400 homes in Bristol before 2026, a percentage of which will be deemed “affordable housing”. Work has started at Catherines House, a well known part of the neglected area of Bedminster, a stones throw away from the developed area of Southville. This project is thought to be the beginning of the push to bring this part of Bristol in line with its glamorous neighbour. It is hoped by many that Bedminster will retain the wonderfully strong community feel it holds and won’t lose the edgy inner city attitude that defines the area. George Ferguson of Ferguson Mann Architects has had a huge part to play in the redevelopment of Bristol. None of the above would be possible without his purchase of the Tobacco Factory back in 1994. The mixed use development is now considered by many as the standard to aspire to. I for one would certainly recommend an evening out in Southville and there is no better starting point than The Tobacco Factory. All this positivity in our local area is driving us forward. We would love to hear from you if you are a developer in Bristol or surrounding area looking for new contractors to work with this coming year. Call our friendly office or drop us an email.